Our user interface design philosophy is simple: to provide elegant, intuitive and user-centric system controls. We engage extensively in program discussions with our clients to discover systems, options and interfaces that best serve their needs. We’ve found that subtle nuances in system requirements are most exactingly realized when we perform control systems programming services as part of a complete solution. 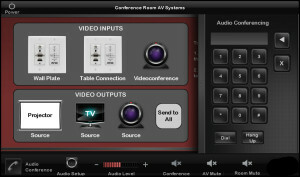 K2 staff are certified programmers for AV control systems such as AMX, Crestron and Extron.